Can we execute a program without main method? The static keyword in Java is used for memory management mainly. We can apply java static keyword with variables, methods, blocks and nested class. The static keyword belongs to the class than an instance of the class. If you declare any variable as static, it is known as a static variable. The static variable can be used to refer to the common property of all objects (which is not unique for each object), for example, the company name of employees, college name of students, etc. It makes your program memory efficient (i.e., it saves memory). Suppose there are 500 students in my college, now all instance data members will get memory each time when the object is created. All students have its unique rollno and name, so instance data member is good in such case. Here, "college" refers to the common property of all objects. If we make it static, this field will get the memory only once. In this example, we have created an instance variable named count which is incremented in the constructor. Since instance variable gets the memory at the time of object creation, each object will have the copy of the instance variable. If it is incremented, it won't reflect other objects. So each object will have the value 1 in the count variable. 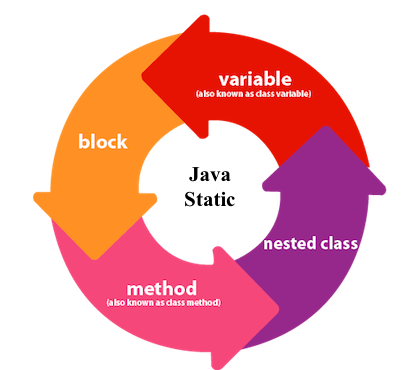 A static method belongs to the class rather than the object of a class. A static method can access static data member and can change the value of it. Q) Why is the Java main method static? Ans) It is because the object is not required to call a static method. If it were a non-static method, JVM creates an object first then call main() method that will lead the problem of extra memory allocation. It is executed before the main method at the time of classloading. Ans) No, one of the ways was the static block, but it was possible till JDK 1.6. Since JDK 1.7, it is not possible to execute a java class without the main method.